This year I started using errorless journal writing in my classroom in order to help all of my students journal their thoughts. It is important to me that my students aren't just copying sentences, but rather are sharing their own thoughts and ideas. If your students are anything like mine, you know getting them to express their thoughts can be difficult! Either they don't have the language to do so, or they are so focused on getting the right answer that they don't know what to choose. These journals help ALL of my students express their thoughts errorlessly. These journals are completed daily in the journal station in my classroom. When journal is on my students' schedules, they go to the back table, get out their work binder and the journal binder. My students or staff will turn to the correct page to display the classroom sample, and students will turn to their journal page in their binder. The same classroom sample is used for all three levels, so this can easily be done at the same time with students of varying levels or even a whole class activity. The classroom sample provides a picture, title, and four simple sentence starters with three *errorless* options to finish each sentence. 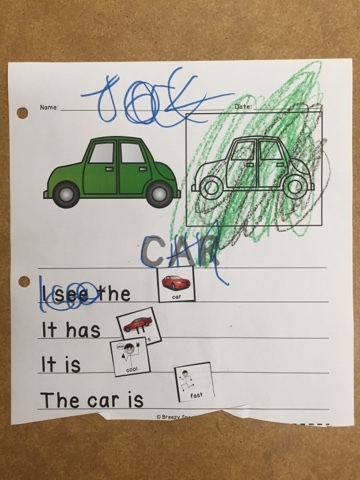 Level 1 students "Non-writers" can color in the picture, trace the title, and cut and paste symbols (with or without aide support) to complete the sentence with their thoughts. Students should color picture based on example (selecting the right color and making a mark on the paper is completely acceptable. Independence, not perfection, is what we are working toward here) and trace the title of the story to the best of their ability. Students will read each sentence with their staff member and/or use their device or voice to speak each sentence. Student will choose from two picture options cut from the bottom of the page (can be errorless depending on pictures staff wants to give as options) to then paste to complete the sentence. 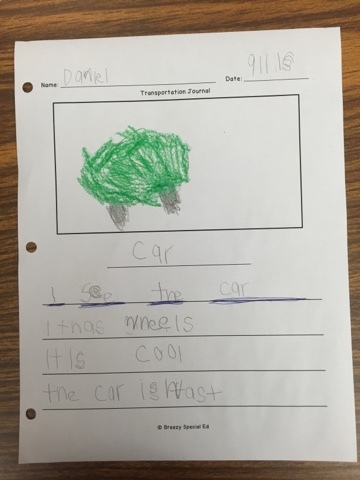 Level 2 students "Tracers" can color in the picture, draw their own, trace the title and sentence starters and finish the thought by circling and/or writing one of the 3 choices (from the classroom sample) on their paper. I have included 2 tracing options, one dotted and one solid gray font so you can pick which one works best for each student at this level. The picture is in black and white for students to color and then a box for them to draw their own pictures. It does not have to be perfect! (Ex. A rectangle for a pool, a circle for a sun. 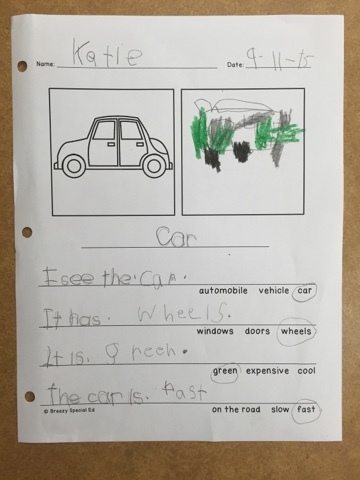 For a lot of our students at this level, drawing skills are also emerging) Sentences starters are in a tracing font and includes word choices on the journal so that students can circle and copy the one word to complete each sentence. For my students who are still learning to space their words, I draw lines on each line for each word. I love hearing how others are using this journals in their classes! Here's what a few people have been saying after they have used these in their classes. Lindsey says "I bought the school supply set to start the year and I just had to splurge on the rest. I LOVE these journals. Great way to differentiate for my kids, we use all three levels in my class. At the end of our journal writing, each student comes up to present their entry and we work on sharing our work, listening and complimenting. Thank you for a great product!" The Differentiated Teacher says "I love these. Most of my students are non-writers and I have not had the time to create materials myself. Thanks for such a great product!" Teaching is a Royal Adventure says "My students were begging for more after we finished this pack so I had to buy the bundle. Thank you for such a fabulous resource!" 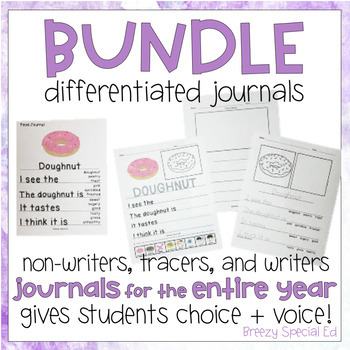 Mary says "This bundled set of differentiated journals is perfect for my classroom. All of my students are able to complete the same topic with success! Thank you so much for creating and sharing your products!" Interested in these journals? They are available by topics here. Topics include holidays, such as Halloween and other fun or educational topics such as food or community workers. If you want to save some money and get all of your journals for the the entire year, you can get ALL of the journals in order to get you through the entire 180 day school year HERE. Congrats on the baby! Love the idea for the journals, but how do you go about making it look more age appropriate for high school students? Parents are asking for more writing/blogging, but we struggle with making it look age respectful. Thank you! There are a few things I have done to make these journals age appropriate for high school students (while considering the developmental age appropriateness as well, ranging from 1 year to 1st grade). I have students write on a single line instead of the primary handwriting lines. I haven't added any cutesy borders or clip-art. Everything on the page is useful and not distracting. Also, I picked themes which are appropriate for high school students, for example, this journal set is all about technology. Other topics include: holidays, transportation, community workers and places, food, etc. Got it and thanks. Its all about balance!! 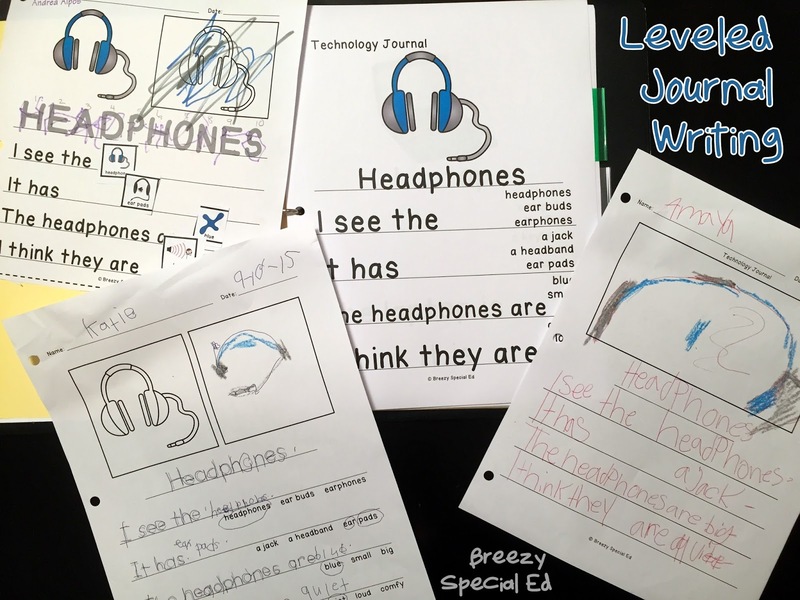 I was so excited to find your post about differentiated journal writing! I loved how you scaffolded the expected skills across three different levels. I am very excited to utilize these journals with one of my kindergarten students with Down syndrome and needs a better option to successfully access the general education writing curriculum. How do you incorporate student choice/interests within these journals? I promise to let you know how the implementation of these journals turns out!